UK Tour : with Blaze Bayley! 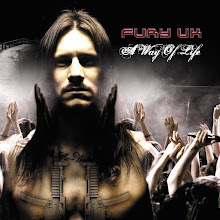 Fury UK is to support the former Iron Maiden frontman Blaze Bayley on his UK tour in May/June 2009. The details are already entered on our gig listings at www.furyuk.com & www.myspace.com/furyuk. There's 24 dates in-all starting 1st May & ending 27th June, across Newcastle, Manchester, Birmingham, London, Southampton, Swansea & many more. The length & breadth of England & Wales. Our good friends & label-mates Decadenze are playing the Scottish leg of the tour in Dumfries, Aberdeen & Glasgow. We've played 4 gigs with Blaze Bayley before & always had a great time in such cool company, also making new friends & fans along the way. This is a fantastic opportunity for us, with this UK tour booked & ready for our 2nd album "VR" due in May. As bassist Luke says "I'm absolutely thrilled to be part of this tour involving a legend like Blaze Bayley & can't wait to get started". That sums it up. What an end to a fantastic year for us, thanks so much to everyone who has supported, helped, promoted us along the way. Roll on 2009! Again, Merry Xmas & Happy New Year to you all. The Brewery Tap, Bradford. Boxing Day. Hark To Towler, Bury. 27th Dec.
New Years Eve. The White Hart, Burnley. We've just done 2 amazing gigs in Blackpool. Saturday at the King Edward VII (the King Eddy to those that know it well) & then Sunday at the Big Blackpool Toy Run charity event held at The Stanley. Thanks to all who came down to these shows & especially to Pat & Kay for helping spread the word about the band since our Blackpool debut at the Royal Oak a few months back, Nina & Tyler for booking us at the King Eddy & also to Ali for booking us for the Toy Run. We loved both these gigs & look forward to booking some more Blackpool shows for 2009 after the new album's ready.